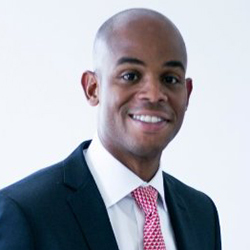 Corey Harrison is a member of the recently announced 2015-2016 class of White House Fellows. Founded in 1964 by Lyndon B. Johnson, the White House Fellows program is one of America's most prestigious programs for leadership and public service. The Fellows represent diverse backgrounds and professions and have demonstrated a strong commitment to public service and leadership. The program was started in 1964 with the intention to give young professionals the opportunity to serve at the highest level of government. Participants are to take lessons learned in the Fellows program and give back to their communities and industries. To participate in a fellowship year, Corey took a hiatus from the private sector, where he most recently served as the Corporate Strategy Executive at iCIMS, a leading talent acquisition software company. At iCIMS, he drove the development and execution of corporate strategy and evaluated merger and acquisition opportunities. He now serves as the White House Fellow for the Secretary of Defense. Corey describes his experience as a Fellow and working at the Department of Defense as "surreal and exciting." "I come from very humble beginnings. This experience is truly an honor. I get to use my private sector background and education to serve our country every day, and I am gaining experience that will make me an even stronger leader in business and society." Corey believes the Leadership & Information Technology Program at Duquesne was invaluable in his professional and leadership development. "I was working in IT at Johnson & Johnson and the tech world was changing so quickly. Globalization and dot.com/dot.bomb were the reigning buzzwords. The technology executives at J&J were stressing the importance of learning to lead technology projects across geographic and functional borders. I found Duquesne's program to be an ideal blend between leadership theory and practical technical experience, all while working in virtual teams. We studied everything from project management to conflict resolution, and the capstone project brought everything together for me. The program had an immediate impact in my ability to add value to my teams and differentiate myself as a young professional at a global company." Shortly after graduating from Duquesne, Corey landed his first management position leading technology teams in Montreal and India from the New Jersey offices of Tata Communications. "Thankfully, my experience at Duquesne had sharpened my ability to communicate virtually and cross-culturally - two competencies that were critical to my success at Tata." Before joining iCIMS, he was an Associate Director at UBS Investment Bank where he advised private equity general partners on raising institutional capital. In addition to his Master's degree from Duquesne, Corey also holds an M.B.A. from Yale University and a B.S. in Business and Economics from Lehigh University. Note: The opinions expressed in this article do not represent those of the United States government.